Today I took out old friends Bob and Zack for a lesson on catching Stripers on Lake Anna. Fishing is a pleasure with them because they have been going out with me since Zack was knee high to me. They understand what it takes to get a fish in the boat when it hooks up and the stringer is proof of it. We started off fishing this morning working the mouth of a major creek and before I got my spread out Jenna hooked up with the first fish of the day in 2 feet of water. Good start for the morning but within the next half hour boat traffic had alerted the fish and we didn't take any more hits. I decided to make a move to get away from the traffic so I found an area with clay banks and no boats and put my boards right up on the banks. We started hooking up again and the fun began. For about two hours the only hits we would take were the on the closest boards to the bank. Then next thing we knew the fish moved off the banks and the only hits we would take were on the board the furthest out in the middle of the creek. I move the boat out to where the fish were and we continued to have fun. We ended up the morning with Jenna hooking up with a nice one on the bobber as we were getting all the other lines in. 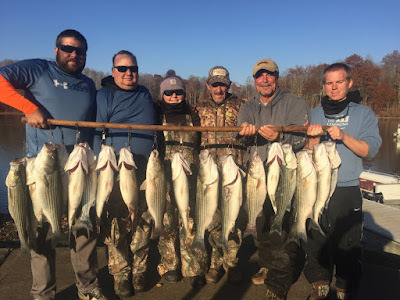 Today we caught 20 Stripers, all but one kept, had 4 or 5 more short strikes that did not hook up, fish averaged in the 5 to 6 pound range. Now the water has cooled down and the oxygen levels are back to normal the fish are feeding up and are very healthy. Looking forward to a great winter of Striper fishing when I am not in the woods looking for Bullwinkle. Kind of ironic...when I am hunting all I think of is fishing, when I am fishing and catching I think of being in the woods. Good to see fish pics again!